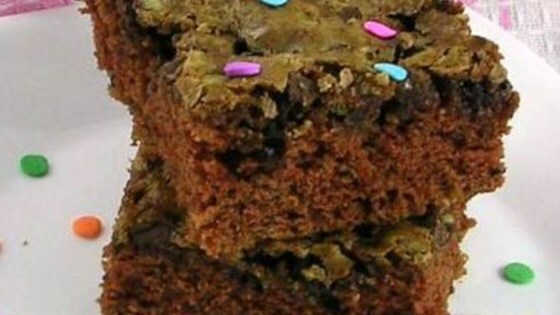 "Moist and wonderful chocolate brownies, no frosting needed. These are perfect right out of the oven!" Preheat an oven to 350 degrees F (175 degrees C). Grease a jelly roll pan. Sift flour, cocoa powder, baking soda, and salt together in a bowl. Beat the butter and 1 1/2 cups sugar with an electric mixer in a large bowl until smooth. Beat the first egg into the butter until completely blended, then beat in the vanilla extract with the last egg. Mix in the flour mixture until just incorporated. Fold in the zucchini; mixing just enough to evenly combine. Pour mixture into prepared pan. Sprinkle the remaining 2 tablespoons sugar, chocolate chips, and walnuts on top. Bake in the preheated oven until the top is dry and the edges have started to pull away from the sides of the pan, 25 to 30 minutes. Good flavor. After tasting it, found it to taste much like my mother's sheet cake, so decided to add the frosting that would be on her sheet cake. My family loved it with the frosting. Perfect right out of the pan brownies! Not over chocolatey. If didn't know it was there, would never guess they have the zucchini in them. Will definitely make these again!